The Geneva Inn is a hotel rich with history and tradition. It’s a favorite spot for many families who have been coming to The Geneva Inn on Lake Geneva for decades. But the Geneva Inn had a problem that many established businesses eventually face: how do they evolve their business + hotel environment to meet modern-day comforts and amenities, while still appealing to the hearts of the customers who like it JUST the way it is? Since the Geneva Inn already had such a strong brand and website, my Mini Brand Package was a perfect fit for them. Their goal was to rebrand their two restaurants to appeal to a younger generation + move all of their marketing in-house. I worked with them to build out a new Brand Strategy that embraced the old with the new - and set them up with a collection of marketing templates + training to allow them to run their marketing in-house. The Geneva Inn has such a rich history rooted in tradition + family. My main focus with the rebranding was to honor the history of the hotel while reframing it’s reputation to be more relatable to a younger generation. Because The Geneva Inn is a known and loved brand in the Lake Geneva community, we didn’t want to make any changes to the existing brand identity. In addition, The Geneva Inn had already worked with a talented logo designer to create the logo + menu for their new restaurants - so we had a LOT of amazing content to help build the foundation of our new brand strategy. The new brand strategy was focused on reframing the brand’s reputation to be more relatable to a younger generation. An updated + modern graphic style, the introduction of a few bolder colors + font families, and a focus on creating an easy-going brand voice were critical to creating this perfect balance. The Geneva Inn had a handful of graphics they had been using for print + digital marketing. Although these graphics were “on brand” with the Inn’s brand standards, we all felt they needed a BIT of a facelift to resonate with a younger generation. In our new brand strategy, we updated these graphics to be more modern - while still staying true to The Geneva Inn’s beloved brand. Although The Geneva Inn had a social presence, content tended to be sporadic and lacking a cohesive aesthetic. In our Brand Strategy, we created clear photography guidelines to create more unity between the quality of the hotel experience + the quality of the social promotions. We also introduced the brand campaign #comeoninn to reframe the hotel as a more casual, straight-from-the-lake destination. Once the Brand Strategy process was completed, The Geneva Inn received their final Brand Book that outlined their Brand Strategy + a basic style guide for their updated marketing assets. 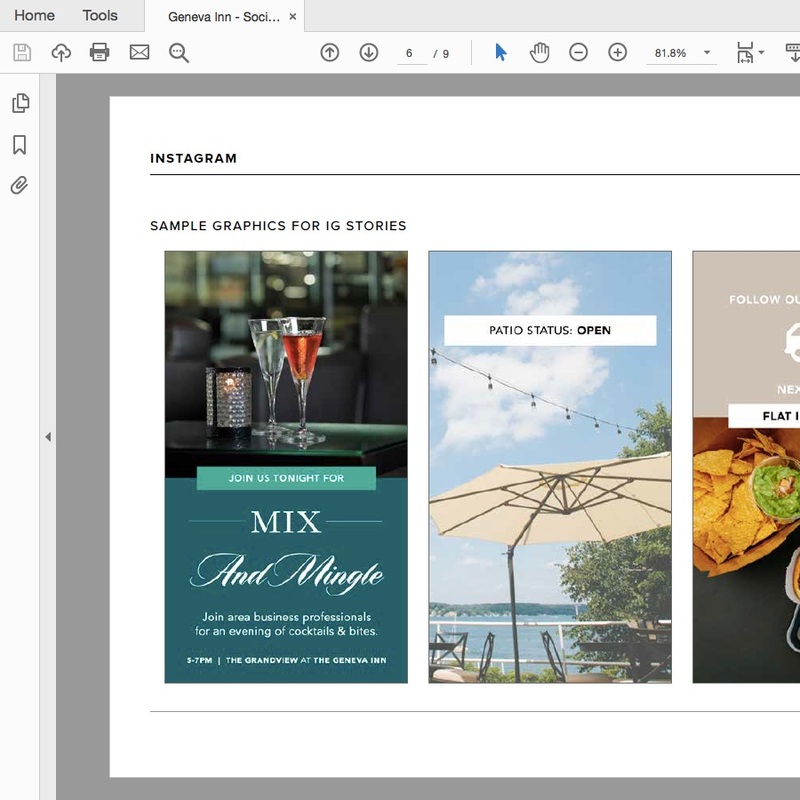 Working with the Brand Book as my guide, I created 25+ branded marketing templates for use on social media, digital ads, print marketing, and on-site hotel bulletins. Upon completion, I trained a selected team member on how to best utilize their new marketing templates and new Brand Book. ready to own your brand? Sign up today for your 4 or 6-week branding project.